When Atoms for Peace released Default late last year, it essentially sounded like a Thom Yorke track. Now the supergroup - comprising of Thom Yorke, Nigel Godrich (long-time Radiohead producer), Flea (Red Hot Chili Peppers), Joey Waronker (previous drummer for REM) and Mauro Refosco (a Brazilian percussionist who worked with the Chili Peppers) – have released their debut album, ‘Amok’ and, like the debut single, this is Yorke all over. Godrich is often cited as the sixth member of Radiohead, so his inclusion in Atoms for Peace is practically inevitable. But the others? Sure the bass is often dynamic, but these are hardly the funk basslines Flea is renowned for. And whilst much of the drumming is now live, Yorke has often played with the complex polyrhythms these drummer provide. Surely the point of a supergroup is that each member brings something different to the table, creating a musical concoction of styles and influences? 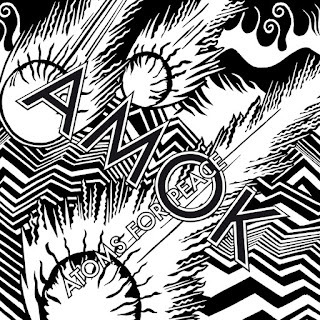 Instead, ‘Amok’ is wholeheartedly within Yorke’s electronic aesthetic. It begs the question – how should this album be judged? Do we look at this as the supergroup it should be? Or simply as another Thom Yorke album? Stuck Together Pieces is a prime example of Atoms for Peace fusing the styles of its members. The funk bass and layered percussion provide the grounding for Yorke’s hushed warbling and electronic effects. It remains, however, an abstract and experimental piece. Album opener Before Your Very Eyes similarly feels collaborative, sounding almost like Californication-era Chili’s. As a whole, ‘Amok’ has a cleaner, more ‘live’ quality than Yorke’s solo work thanks to his bandmates, but they feel more like session musicians drafted in to heighten Yorke’s imagination. In comparison to Radiohead, the tracks lack distinction. Yorke’s original band are finely tuned and have honed their craft over a series of albums each with their own personality, whereas ‘Amok’ is predominantly meandering experimentation. The most successful tracks are those that rely most heavily on Yorke’s influence. Default presents an intricate web of jittering beats, shifting textures and weird sound bites; the beat of Dropped is infectious; and the ghostly vocal effects of the title track are truly haunting. That said, even the best tracks of ‘Amok’ lack the unique ingenuity of Yorke’s 2006 album ‘The Eraser’. There's definitely potential here and perhaps in a live set the music will thrill more, but recorded this rarely rises above the level of interesting experimental side-project. As a Thom Yorke album this doesn’t live up to his best work; as a supergroup this is neither a piece of teamwork, nor is it super. Listen: 'Amok' is released on 25th February.